Unlike gold or platinum jewelry, your sterling silver jewelry needs some special care to stay as beautiful as the day you brought it home. However, keeping your sterling silver jewelry looking good does not have to be a chore. Silver jewelry can tarnish under the right conditions. Your sterling silver jewelry is 92.5% pure silver with copper or other metals added to make the silver more durable. The copper in the sterling silver alloy reacts with moisture and sulfur in the air to oxidize or tarnish the surface of the jewelry. Your silver jewelry will tarnish faster in areas of high humidity and air pollution. Other agents such as hairspray, lotion, perfume, deodorant and other chemicals can accelerate the tarnishing process as well. Some people’s body chemistry can also contribute to rapid tarnishing. One of the easiest solutions to prevent your silver jewelry from tarnishing is to wipe your rings or other jewelry with a jewelry polishing cloth. The best polishing cloths have two layers or sheets. One sheet is treated with chemicals that clean and whiten the silver. The second layer is a soft cloth that is great for rubbing and buffing the piece of jewelry to maintain its luster. If you use your polishing cloth on a regular basis you should be able to prevent tarnish from ever forming on your jewelry. As an added precaution, some people find that storing their silver jewelry in an airtight plastic bag keeps tarnish at bay. This may be a great solution for customers who do not wear a particular piece of jewelry very often and storing it in a plastic bag may not only prevent it from tarnishing but also protect it from being scratched by other jewelry in your collection. If you discover that your inlaid sterling silver jewelry has stubborn tarnish build up that just won’t wipe away, there are several things you should not attempt. Do not dip your sterling silver jewelry in a tarnish removing liquid or rub a tarnish removing cream on your jewelry if it has inlay, enamel or other sensitive gemstones on it. The tarnish remover could damage the stones or the epoxy used to secure the inlay in place. The same is true for an ultrasonic jewelry cleaner. While ultrasonic cleaners are great to remove “gunk” buildup around your gemstones, the powerful high-frequency sound waves can damage the epoxy holding the inlay in place, damage enameling and harm some gems. No inlay jewelry should ever be placed in an ultrasonic cleaner and you should always consult a jeweler to see which gemstones are safe for ultrasonic cleaning. The best way to remove stubborn tarnish is to take you silver jewelry to a jeweler and they will use a polishing compound with a buffing wheel will to make short work of the tarnish. These measures will help your silver inlay jewelry stay looking great and tarnish free but the most important step is preventing damage to the inlay while wearing your jewelry. Earrings and pendants are rarely damaged from everyday wear but rings can easily be nicked, scratched or dented from the objects your hands come into contact with on a daily basis. Silver is the softest of all the precious metals so some care must be taken to prolong the life of your favorite silver ring. 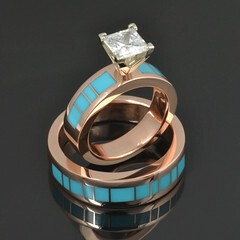 Some activities will be detrimental to both the inlay and the metal in your sterling silver ring. Remove your ring before gardening, yard work, swimming, rock climbing, weight lifting or any activity that could jeopardize your ring or possibly injure your finger if your ring gets caught or crushed. 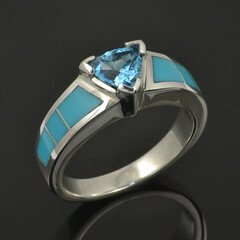 A little common sense will go a long way toward keeping your silver inlay ring damage free. 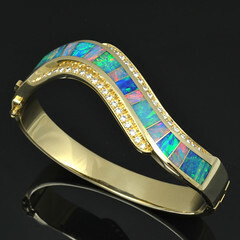 The above suggestions will keep your jewelry looking good longer as well as extend the life of your jewelry. Eventually, your inlaid stones and the silver will lose their luster and it will be time to send the ring or jewelry back to the maker to be refinished. Shop our top quality silver inlay jewelry at shop.HilemanSilverJewelry.com and read about our tarnish resistant Continuum silver option.